KIEV, Ukraine -- Russian aggression is to blame for violence in eastern Ukraine, where people are dying in what should be seen as a "hot war" rather than a "frozen conflict", the U.S. special envoy to Ukraine peace talks said on a visit to Ukraine on Sunday. 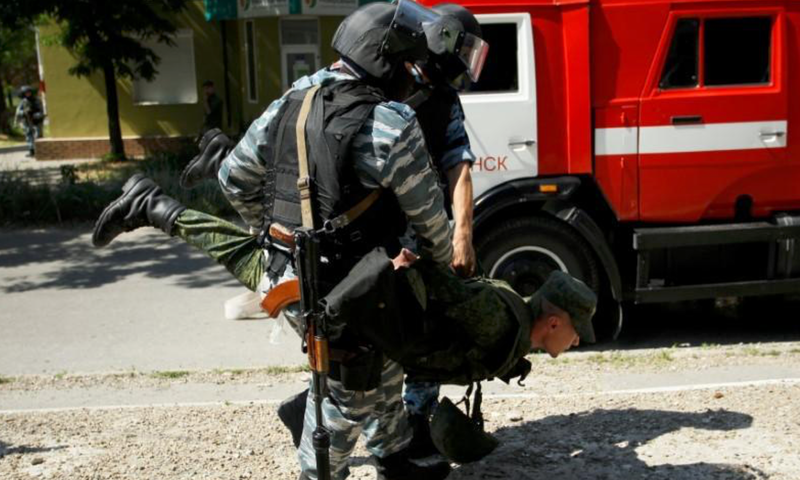 Members of the self-proclaimed Luhansk People's Republic's Berkut police carry a man acting as a victim of a terrorist attack, during an anti-terrorism drill in the rebel-held city of Luhansk, Ukraine, July 21, 2017. "This is not a frozen conflict, this is a hot war, and it's an immediate crisis that we all need to address as quickly as possible," he said. Relations between Ukraine and Russia went into freefall after Moscow's 2014 annexation of Crimea and the subsequent outbreak of a pro-Russian insurgency in the eastern Donbass region. 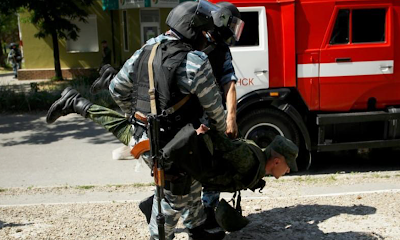 Ukraine accuses Russia of sending in its own soldiers and military equipment, which Moscow denies. "We've seen what's happened, we understand the way this conflict has begun, we understand the way it is being managed today, and that's why it's important that the United States become more engaged." U.S. Secretary of State Rex Tillerson said in early July that Russia must make the first move to bring peace to Ukraine, which President Petro Poroshenko called a powerful signal of Washington's backing.